COLUMBIA, Mo 12/17/14 (Beat Byte) -- Columbia Mayor Bob McDavid this week proposed transferring $5 million from the city's General Fund to fire and police pensions. But wait! The General Fund -- which pays for active-duty firefighters and police officers -- was so broke that just last month, McDavid insisted the public increase property taxes. So how can the city take $5 million from it for pensions? The answer: by using money from the General Fund's "Unrestricted" portion, at last count $26,350,000. 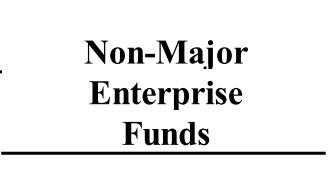 Mostly fee-for-service utilities, city government's enterprises include the Water and Light Utility; the Sanitary Sewer Utility; and several small utilities and services called "non-major enterprises." 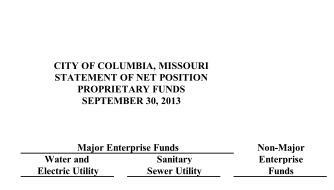 Columbia city government's non-major enterprises have made major profits over the years. From trash hauling to airport operations, these eight little businesses have accumulated $15,629,959 in the "Unrestricted" portion of their balance sheets as of Sept. 2013, the last date the city published its Comprehensive Annual Financial Report (CAFR). 1) Parking Utility: City parking lots, garages, and parking meters. 2) Recreation Services: Parks and Recreation Department services that charge fees. 3) Storm Water Utility: stormwater management and drainage facilities. 5) Columbia Regional Airport: airport revenues and expenses Columbia Regional Airport. 7) Railroad: railroad operations from Centralia to Columbia. 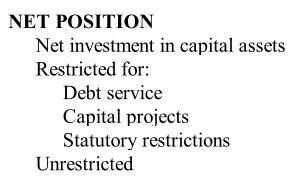 With over $144 million in Unrestricted funds across all its accounts, voters have been asking why City Hall keeps demanding more money: in bond debt; rate hikes; fee hikes; fine hikes; and tax hikes. 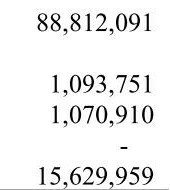 So far, the Heart Beat has examined the Water and Light Utility's $73,888,661 Unrestricted balance and the Sanitary Sewer Utility's $11,733,871 Unrestricted balance; and the General Fund's $26,350,000. We'll wrap up with the rest of the money in our final segment.